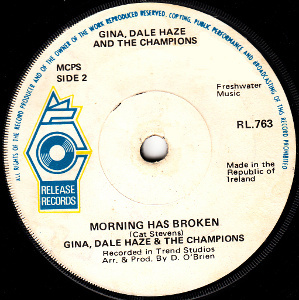 Long running pop showband from Cork who were very successful over most of their career, spanning 1973-1992 approx. Pat and Mossie Walsh are brothers. Pat Walsh married Gina AKA Mary Hurley. 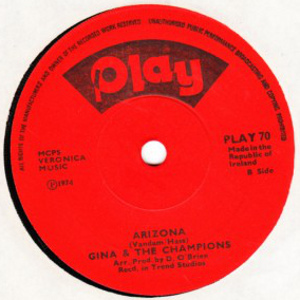 The Champions began in 1973 with the less than inspiring name Gina & The Herdsmen. They played small venues with some degree of success which led to their first record, the Paper Mansions EP in 1973. While it didn't cause much of a stir, it was plain to some that they had real potential, and they signed a management deal with Tony Byrne of Tommy Hayden Enterprises (THE). The first order of business was undoubtedly the selection of a new name. 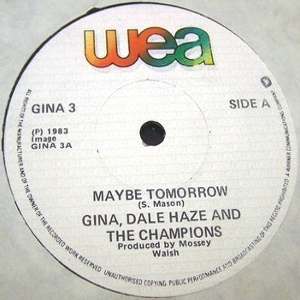 After various ideas were tried and rejected, the band finally settled on The Champions, following Cork's victory in the All-Ireland GAA football final in September '73. 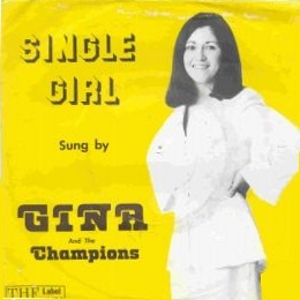 They became Gina & The Champions and the new name stuck. Their next record, a cover of Vicki Leandros' hit, Dreams Are Good Friends, met with moderate success, entering the Irish charts. 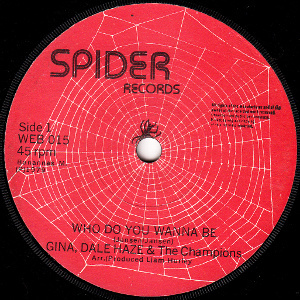 Backing singer Dale Haze, still known as Jerdi Mackey, took the lead vocal on the B-side of their next release Single Girl (not sure if Dreams Are Good Friends or Single Girl was released first - can anyone confirm?). 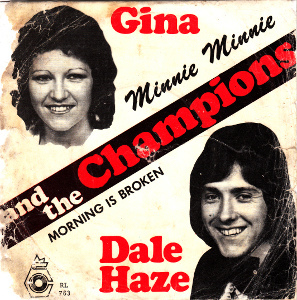 By 1975 he'd become Dale Haze and joined Gina in the spotlight as co lead vocalist. 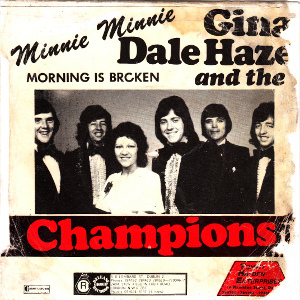 From here on they were (mostly) billed as Gina, Dale Haze & The Champions. The band built up a large following on the ballroom scene and had a powerful sound to match. Like a lot of home-based acts of the era, when it came to recording, they were primarily a singles band. While their earlier recordings were made in Dublin, much of their latterday material was recorded in various London studios, notably Red Bus. 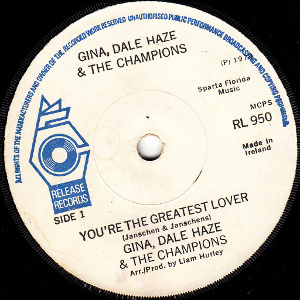 These singles received a lot of airplay on RTE, Ireland's only radio station outside Dublin at the time. 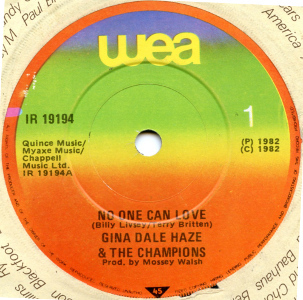 While they were well-produced, these singles were almost exclusively covers. The band's management kept their eye on european charts throughout the 70s and early 80s, looking for hits to cover from Holland and elsewhere. 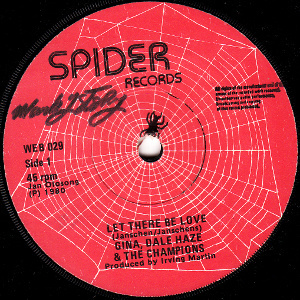 There are few originals in the Champions songbook. Their first album, aptly titled From the Beginning, was issued by Release Records in late 1977. This was a 16-track compilation of eight A-sides, five B's and (unless someone can inform us otherwise) three tracks exclusive to the album. 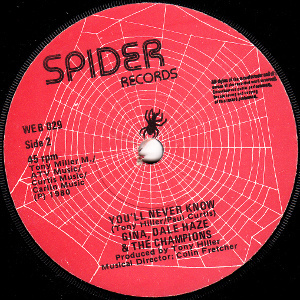 This pattern of albums consisting of mostly singles plus a few previously unreleased tracks continued on subsequent albums released on Spider Records, WEA (Ireland) and CBS Records. 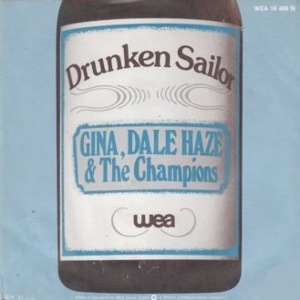 Dale Haze released a solo album in 1981. 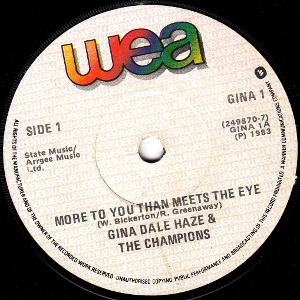 Gina launched a solo career circa 1985, releasing a number of singles. 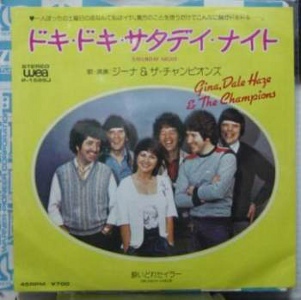 We're not sure if her backing band was in fact The Champions, but it seems likely. The band seemed to disappear in the early 90s. 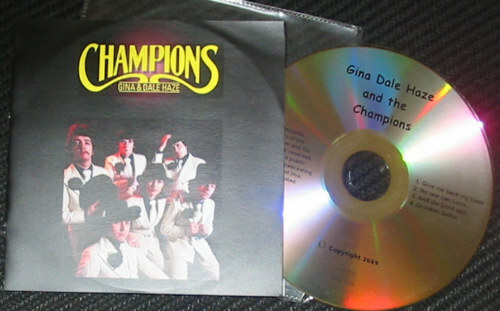 The Champions reformed in 2009 for a nationwide tour. A 19-track Best of CD was released at the same time (see discography below for details). The reunion tour was a great success and led to a sustained a revival over subsequent years. They still gig occasionally and have released more CDs. Remastered versions of their recordings are reputedly in the pipeline. 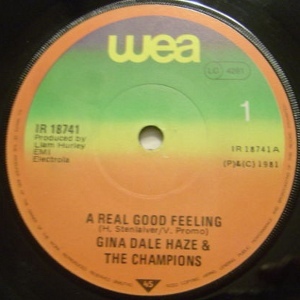 Did this have a second issue re-credited to Gina & The Champions in 1974? 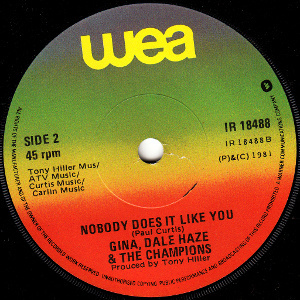 Entered the Irish charts on 21.02.1974, peaking at #12. 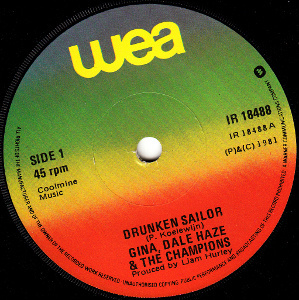 Vicky Leandros cover, initially recorded by her as Meine Freunde Sind Die Träume. Not sure if this is the 2nd or 3rd single. Recorded in Eamon Andrews Studios, produced by Liam Hurley. Entered the Irish charts on 27.02.1975, peaking at #5. Entered the Irish charts on 01.09.1977, peaking at #8. 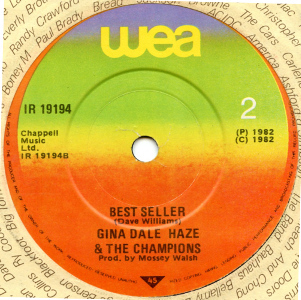 Entered the Irish charts on 23.06.1977, peaking at #2. 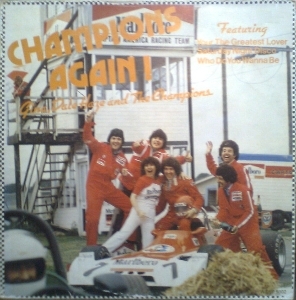 Reissued on cassette with Champions Again! (1980) on WEA. Notes: Produced by Liam Hurley except A2/A4/A5 and B3/B5/B7 produced by Dermot O'Brien. Recorded at Lombard Sound, Dublin Sound and EA Studios. All tracks are covers/standards apart from last track, co-written by Liam Hurley. A-side by Janschen & Janschens. Arranged & produced by Liam Hurley. B-side by Holten/Manenkei/Holten. Arranged & produced by Liam Hurley. Entered the Irish charts on 01.02.1979, peaking at #10. 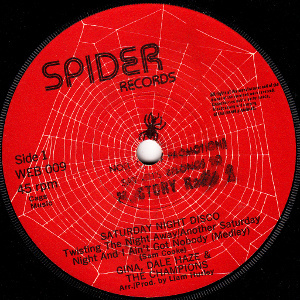 7" - Spider Records - WEB009 - IRL - 1979 - PS? Notes: The A-side medley contains two Sam Cooke songs, "Twisting The Night Away" and "Another Saturday Night And I Ain't Got Nobody". B-side by Peter Yarrow. Both sides arranged and produced by Liam Hurley. A-side by Jansen/Jansen. Arranged & produced by Liam Hurley. B-side by Rolf Soja/Frank Dostal. Arranged & produced by Dermot O'Brien. Entered the Irish charts on 23.09.1979, peaking at #7. 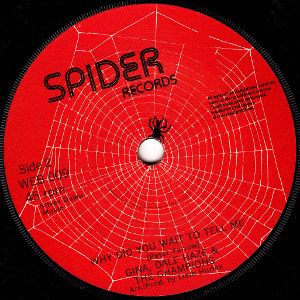 7" - Spider Records - WEB029 - IRL - 1980 - PS? A-side by Jansen/Jansen. Produced by Irving Martin. B-side by Tony Hiller/Paul Curtis. Produced by Tony Hiller. 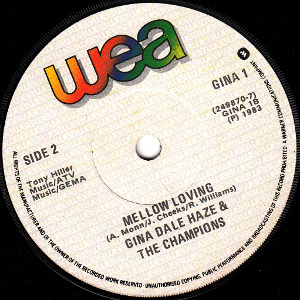 Reissued on cassette with From The Beginning (1977) on WEA. Notes: Contains 4 new tracks plus 8 recordings previously released as the A and B sides of 4 singles: Releaase RL 935, Releaase RL 950, Spider WEB09 and Spider WEB015. 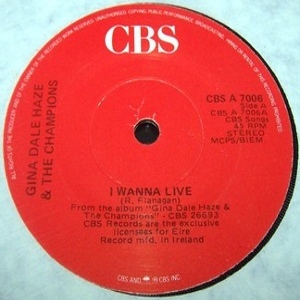 Entered the Irish charts on 29.03.1981, peaking at #13. A-side by Peter Koelewijn, produced by Liam Hurley. B-side by Paul Curtis, produced by Tony Hiller. 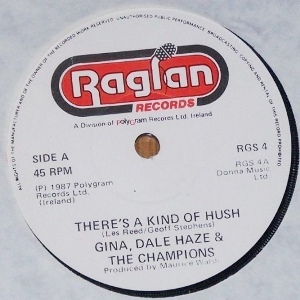 Entered the Irish charts on 07.06.1981, peaking at #15. Entered the Irish charts on 13.09.1981, peaking at #11. Notes: A1, A3-A4, N1, B4-B5 produced by Liam Hurley. A2, A6, B6-B7 produced by Tony Hiller. A5, A7, B2-B3 produced by Irving Martin. Notes: A1,A3-A6, B2-4 produced by Liam Hurley. A7, B1, B5, B7 produced by Mossy Walsh. A2, B6 produced by Irving Martin. Compilation and design: Brian Wynne. A-side by Wayne Bickerton & Roger Greenaway. Entered the Irish charts on 13.03.1983, peaking at #14. Entered the Irish charts on 20.11.1983, peaking at #24. • From The Beginning / Champions Again! K7 - WEA Records - IR 468041 - IRL - 19?? 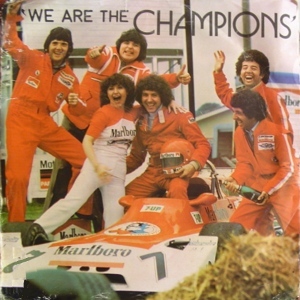 Reissue of From The Beginning (1977) and Champions Again! 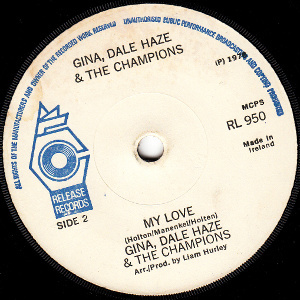 (1980) on a single cassette. Entered the Irish charts on 18.07.1985, peaking at #18. 7" - CBS Records - 6632 - IRL - November 1985 - PS? 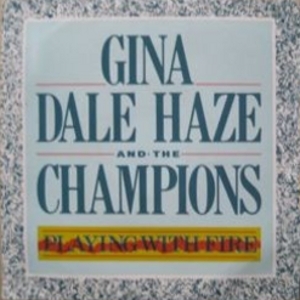 From the forthcoming "Gina Dale Haze & The Champions" LP. Collects various 1983-86 A and B sides. Released early '86. 7" - Raglan Records - RGS 4 - 1987 - no PS? Entered the Irish charts on 02.01.1987, peaking at #15. • Gina - Breakaway / ? 7" - Chart Records? - ??? - October 1988 - no PS? Entered the Irish charts on 27.10.1988, peaking at #19. Entered the Irish charts on 02.07.1990, peaking at #20. 7" - Koffi Records - KOFFS 1 - IRL - 19?? - PS? K7 - Koffi Records - 4 KOFF 1 - IRL - 19?? K7 - Koffi Records - 4 KOFF 2 - IRL - 19?? 4 track cassette EP. Both sides contain the same tracks. 7" - Koff Records - KOFF 3 - IRL - 1991 - PS? 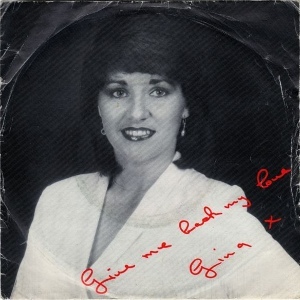 • Gina - The Cause Of It All / ??? 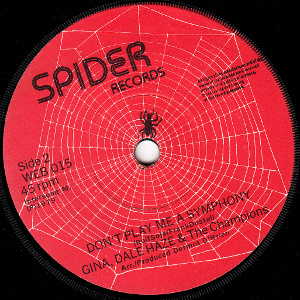 7" - label? - ??? - IRL - 1992 - PS? 4-track EP, probably self released, taken from the Best Of CD.